©1978 Paramount Pictures Corp. and Norway Corp. The White Rabbit and Alice in Wonderland? A knight on horseback? Don Juan, a Samurai warrior, a World War II fighter plane? These strange sights await Kirk and the crew of the Enterprise when they beam down for shore leave on a mysterious planet. Is it all an illusion or some sort of trick? So it would seem, until the knight charges Dr. McCoy - and kills him! 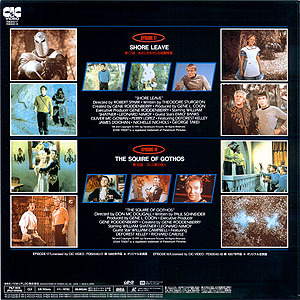 The script is by Theodore Sturgeon, award-winning science fiction writer, who also write the episode Amok Time. Enroute to Colony Beta Six, the Enterprise is trapped in orbit around an uncharted planet - a planet that shouldn't be there! Kirk discovers its sole inhabitant is an illogical but extremely powerful alien named Trelane (William Campbell), who challenges Kirk to a fox hunt - with Kirk playing the fox - in return for the Enterprise's freedom. 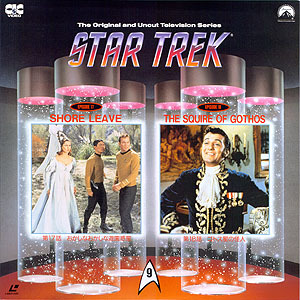 Listen closely to the voice of Trelane's father - it's none other than James Doohan (Scotty). William Campbell played a Klingon, Captain Koloth, in the episode The Trouble with Tribbles.